Josephine Baker, the mid-20th century performance artist, provocatrix, and muse, led a fascinating transatlantic life. I recently had the opportunity to pose a few questions to Anne A. Cheng, Professor of English and African American Literature at Princeton University and author of the book Second Skin: Josephine Baker & the Modern Surface, about her research into Baker’s life, work, influence, and legacy. 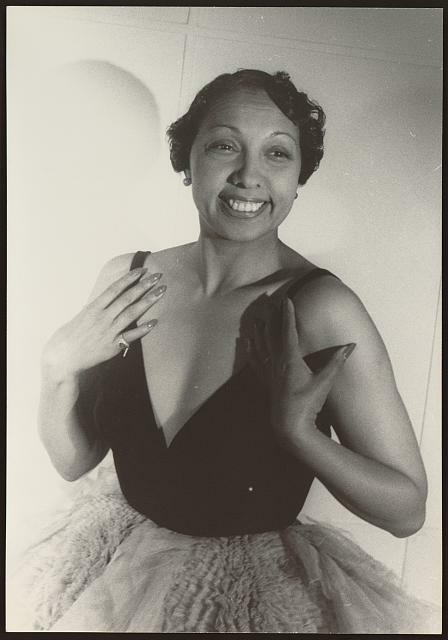 Josephine Baker, as photographed by Carl Von Vechten in 1949. Courtesy of the Library of Congress. Baker made her career in Europe and notably inspired a number of European artists and architects, including Picasso and Le Corbusier. What was it about Baker that spoke to Europeans? What did she represent for them? Baker was present at the March on Washington in August 1963 and stood with Martin Luther King Jr. as he gave his “I have a dream” speech. What did Baker contribute to the struggle for civil rights? How was her success in foreign countries understood within the African American community? These are well-known facts about Baker’s biography: in the latter part of her life, Baker became a very public figure for the causes of social justice and equality. During World War II, she served as an intelligence liaison and an ambulance driver for the French Resistance and was awarded the Medal of the Resistance and the Legion of Honor. Soon after the war, Baker toured the United States again and won respect and praise from African Americans for her support of the civil rights movement. In 1951, she refused to play to segregated audiences and, as a result, the NAACP named her its Most Outstanding Woman of the Year. She gave a benefit concert at Carnegie Hall for the NAACP, the Student Nonviolent Coordinating Committee, and the Congress of Racial Equality in 1963. What is fascinating as well, however, is the complication that Baker represents to and for the African American community. Prior to the war and her more public engagement with the civil rights movement, she was not always a welcome figure either in the African American community or for the larger mainstream American public. Her sensational fame abroad was not duplicated in the states, and her association with primitivism made her at times an embarrassment for the African American community. A couple of times before the war, Baker returned to perform in the United States and was not well received, much to her grief. I would suggest that Baker should be celebrated not only for her more recognizable civil rights activism, but also for her art: performances which far exceed the simplistic labels that have been placed on them and which few have actually examined as art. These performances, when looked at more closely, embody and generate powerful and intricate political meditations about what it means to be a black female body on stage. Did your research into Baker’s life uncover any surprising or unexpected bits of information? What was the greatest challenge you experienced in carrying out your research? I was repeatedly stunned by how much writing has been generated about her life (from facts to gossip) but how little attention has been paid to really analyzing her work, be it on stage or in film. The work itself is so idiosyncratic and layered and complex that this critical oversight is really a testament to how much we have been blinded by our received image of her. I was also surprised to learn how insecure she was about her singing voice when it is in fact a very unique voice with great adaptability. Baker’s voice can be deep and sonorous or high and pitchy, depending on the context of each performance. In the film Zou Zou, for example, Baker is shown dressed in feathers, singing while swinging inside a giant gilded bird cage. Many reviewers criticized her performance as jittery and staccato. But I suggest that her voice was actually mimicking the sounds that would be made, not by a real bird, but by a mechanical bird and, in doing so, reminding us that we are not seeing naturalized primitive animality at all, but its mechanical reconstruction. For me, the challenge of writing the story of Baker rests in learning how to delineate a material history of race that forgoes the facticity of race. The very visible figure of Baker has taught me a counterintuitive lesson: that the history of race, while being very material and with very material impacts, is nonetheless crucially a history of the unseen and the ineffable. The other great challenge is the question of style. I wanted to write a book about Baker that imitates or at least acknowledges the fluidity that is Baker. This is why, in these essays, Baker appears, disappears, and reappears to allow into view the enigmas of the visual experience that I think Baker offers. Baker’s naked skin famously scandalized audiences in Paris, and your book is, in many respects, an extended analysis of the significance of Baker’s skin. Why study Josephine Baker and her skin today? What does she represent for the study of art, race, and American history? Did your interest in studying Baker develop gradually, or were you immediately intrigued by her? I started out writing a book about the politics of race and beauty. Then, as part of this larger research, I forced myself to watch Josephine Baker’s films. I say “forced” because I was dreading seeing exactly the kind of racist images and performances that I have heard so much about. But what I saw stunned, puzzled, and haunted me. Could this strange, moving, and coated figure of skin, clothes, feathers, dirt, gold, oil, and synthetic sheen be the simple “black animal” that everyone says she is? I started writing about her, essay after essay, until a dear friend pointed out that I was in fact writing a book about Baker.